Want to cut your carbon footprint and get a buzz at the same time? Grab a bottle of wine from the Sonoma Wine Company in Graton, California. The winery is the pilot project for Cogenra Solar, a startup backed by top VC Vinod Khosla. It brings together photovoltaic and solar thermal technologies to produce hot water and electricity from a single unit. 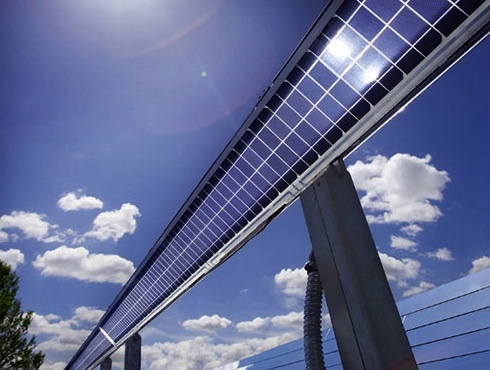 Cogenra’s technology reflects sunlight into a solar array that in turn faces down into a mirror. A tube located above the array carries liquid that has been heated by sunlight reflected off the mirror. That heat is then used to produce hot water. captures this waste heat and transforms it into real value—hot water. components, which boosts the system’s electric generation. communities, hospitals. Everywhere where there is industry, industry uses heat,” says Dr. Gilad Almogy, Cogenra’s CEO. That includes wineries. As part of the pilot project with Sonoma Wine, Cogenra has set up a 272 kW electric and thermal installation to support the facility’s operations. “We give them electricity to run the plant, and heat to run the winery,” Almogy says. The installation, which is partially funded by a $1.5 million research grant from the California Solar Initiative Research, Development, Deployment and Demonstration program, will be completed by the end of the year.